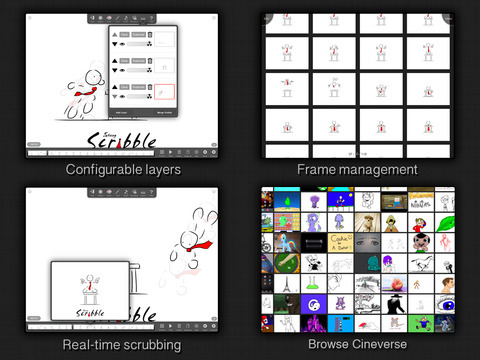 What do you get when you combine the most popular iPad drawing apps and the #1 hottest animation app? – Animation Creator HD! Easily Create Awesome Animations any time! An "App Store Essential: Painting & Drawing"
Plus, Share Animations on Cineverse* for Free! 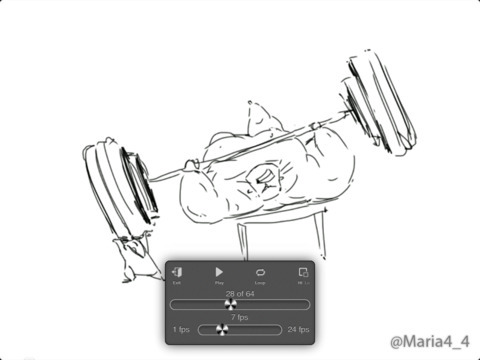 Animation Creator HD allows your creativity to come to life on your iPad or iPad Mini. Be the director! Simple, yet powerful drawing tools, color options, and easy frame management, limited only by your imagination! Create amazing, life-like animations with Retina quality and the high frame rate playback of Animation Creator HD! The only Animation Brand to hit the Top 10! Apple Retail Store Featured Display! App Store ‘What’s Hot’ in 50 Countries! ACHD & Cineverse just got even better! • Select upload Category for Cineverse! • Ultra HD 4K, 1920×1080, 1280×720 & more! • Undo/Redo – no limit! See for yourself why Animation Creator is one of a kind! Take your animations to the next level with Audio and HD! Your kind Ratings help keep the updates coming! New features are planned regularly, including more drawing tools, more animation sharing methods, photo importing, and much much more! Thanks to everyone for their feedback, we listen! Screenshots provided by the creators of Johnny Scribble ©. The online animated series powered by Animation Creator! All Data & Info ©, ™, ® 2008/2014 miSoft, LLC.